I overheard in the chatter at Evie’s that the chair will be out until October 31st. The letters rotate every five minutes, so your letter is sure to come up sooner rather than later. ^^ I don’t know how long the Fishy Strawberry chair will have the bloody butcher jeans and the letters rotate every ten minutes. I *really* like these jeans. I think I’m going to have to get them for my altie, too. Oh, just a side note: if your av is built anything like mines, then you will probably have to edit the leg prims to fit a little better, but it’s a minor edit and really elementary stuff. 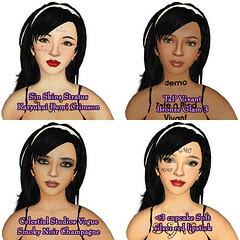 Okay, vital skin info: these skins are mod/copy/no trans. They’re also 0L. Yup, these beauties are freeeeee! 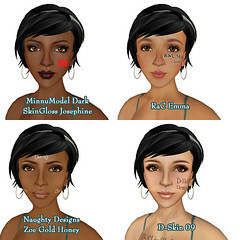 I’m mainly focusing on the face and won’t be going into detail about the body in this post; I encourage you to pick up these skins for yourself to take a look. I will say this, though: as always, Eloh’s work on the body is gorgeous. 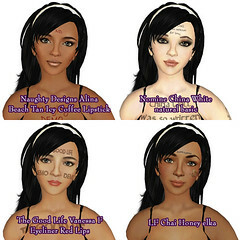 There are four skintones available: dark, fair, tan, and pale. 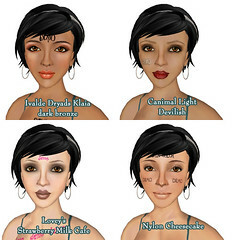 For each skintone, there are seven makeups available, all named after the Pleiades (of course). 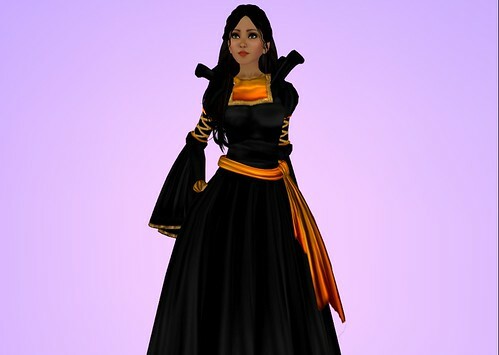 This time around, Eloh has the hair color details painted on instead of being adjustable via the sliders (as the case is with her previous skins), and they have hair painted onto the skullcap as well. You know, I’ve never been a big fan of the whole painted skullcap thing, except for at events where everyone will wish death upon you and your immediate family for not deprimming. I liked that Eloh’s painted skullcap has a hairline that is pretty far up, and the hairline is drawn in such a way that it blends nicely with prim hair. Anyways, enough of my yammering, right? On to the pics! There is no way I would have enough time to take a pic of every single skintone/makeup/freckle combination… so all I shall present here is a sample. Besides, you’re going to want to see how it looks on your own shape anyways and at 0L you’d be pretty silly to not go and treat yourself (and your alties, hehe) to these. Clicking on the images will take you to their respective flickr pages, where you can view full sized images (roughly 1000×1450) if you are on my list of flickr contacts. Not on my contact list? Add me, and I will reciprocate! All images have had no postproduction done on them, other than cropping. I won’t be offering the same PSDs I work with–that’d just be sadistic. Instead, I plan on distilling my currently leviathan-esque PSDs into something more usable and intuitive–in both PSD and XCF (Gimp) formats in the very near future. In the unlikely scenario that you’re still reading this, miffed at my reckless audacity to not actually offer the PSDs with which I work–fear not, in the following weeks I’ll post exactly (in excruciating detail) how you can produce those very PSDs from the AI files that are currently available on my repository (2) (3). Eloh, you effin’ RAWK, do you know that? ❤ Just had to tell you this in case you didn’t already know 🙂 I’ve personally played with Illustrator in a sort of scratch-the-surface manner and I’ve got a lot to learn, but this just might be the motivation I need to take a new crack at it. 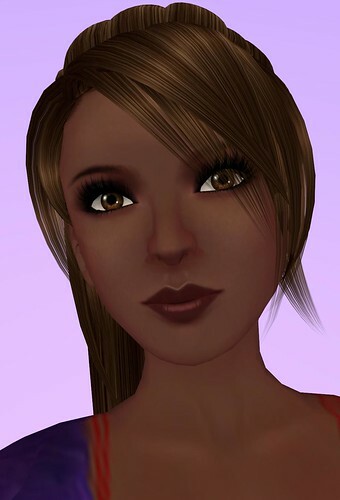 To read more discussion on Eloh’s views on open-source skins, her experiences with creating/sharing them with the SL community, as well as updates on her latest, check out her blog at eloheliot.blogspot.com. 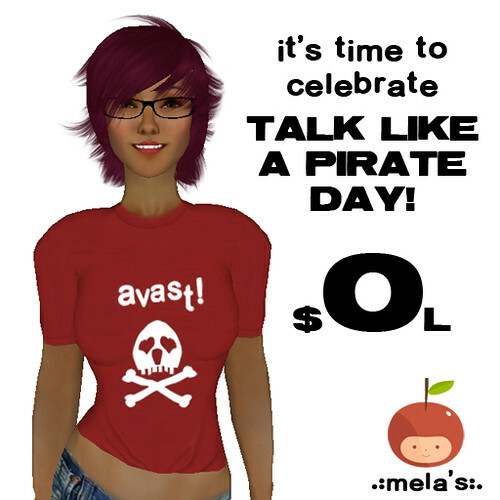 I made a freebie t-shirt to celebrate one of my favorite holidays :p Pick one up at any of my three store locations in LicoLico, The LOLO, or Fashion Mode. w00t!